KOLKATA: Prime Minister Narendra Modi and West Bengal Chief Minister Mamata Banerjee kept each other in their cross hairs as they addressed election rallies in the state last week. When on one hand Modi dubbed Banerjee a "speedbreaker known as Didi" for allegedly slowing down development, Banerjee claimed that if the Bharatiya Janata Party's "expiry babu" returns to power in 2019, LS elections would no longer be held as that party would modify the Constitution. 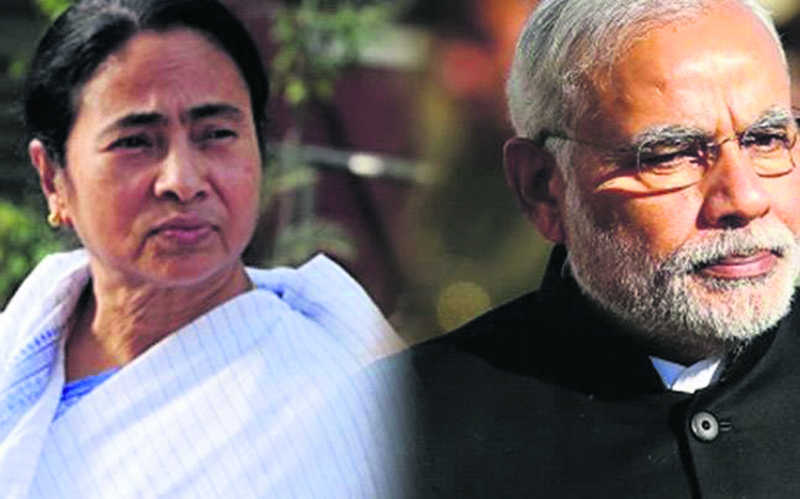 While Modi accused the CM of obstructing his development juggernaut in the state and striking at the morale of India's armed forces by questioning the Balakot strike, Banerjee dubbed him an "expiry babu", meaning he had reached the end of his term, and alleged "fascist" and a "rioter". The Trinamool Congress chief said, "If the BJP returns to power in 2019, Lok Sabha polls will not be held anymore because they will change the Indian Constitution." She unleashed a scathing attack on Modi, accusing him of being "communal" and "anti-poor" and taking care to repeatedly call him "expiry babu" to drive home that the tenure of the present government was nearing its end. Banerjee also echoed an allegation made by Aam Aadmi Party's Arvind Kejriwal, claiming for the first time that the BJP would fundamentally change the Constitution if it came back to power. Most part of her 40-minute speech focused on Modi, whom she accused of misleading the people and using the armed forces for political gain. Banerjee asked, "You claim to be chowkidar of the country. In that case, why did you fail to protect the soldiers who died in Pulwama, despite having intelligence inputs on the terror attack? What right do you have to call our armed forces 'Modi Sena'?" Meanwhile, the PM urged the people to eject the TMC from the state to get the full benefits of his brand of development. He said, "I have not been able to deliver development in Bengal at the pace I have achieved in other states. This state has a speed breaker, which is known as Didi." Modi also took potshots at Banerjee for raising questions on India's airstrike in Pakistan's Balakot, undertaken in retaliation to the suicide attack on a Central Reserve Police Force convoy in Pulwama that killed 40 troopers on February 14. “We hit there (Balakot) but it hurt people here. Kolkata’s Didi was more pained than people in Islamabad and Rawalpindi. We hit them by entering their territory, but Didi did not like it. Not only she, all other leaders of the mahagathbandhan [grand alliance] too. They shouted so much that they became heroes in Pakistan. There is a conspiracy to weaken our armed forces. Wouldn’t you foil this conspiracy? This election is also for showing respect to our armed forces,” Modi said in Siliguri. He also accused Banerjee of denying the people of the state the benefits of the Ayushman Bharat health insurance project, the Kisan Samman Yojana and the Real Estate Regulations Act, among others. He claimed that Banerjee did not care about the poor. “If poverty is removed, her politics will end. The same is true for the Communist Party of India (Marxist),” he said.